Meet Molly, a LhashaPoo Pup, five and a half months old. She's still a bit shy, but is sure to be quite friendly and outgoing. 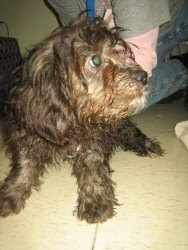 The Girls saw her online, and Amy met her and decided to take her from a Rescue Kennel in Chester Springs PA yesterday. Took her straight to the vet - where she got a clean bill of health. This isn't spur of the moment, the girls have been researching for a few months about dogs, rescue, and what breeds would be a good fit for our family. I think they did a great job, and look forward to travels with Molly. BTW - Her eyes are Chocolate Brown - it's how the flash caught her. no way!!! that's awesome, what a cool addition to the Karl Family! Miss you guys!! She is beautiful, I cant wait to meet her, Indi is excited too!